Old Man River « R-V There Yet? We enjoyed our stay at the Ohio River so much that we thought we’d do the same on the Mississippi. 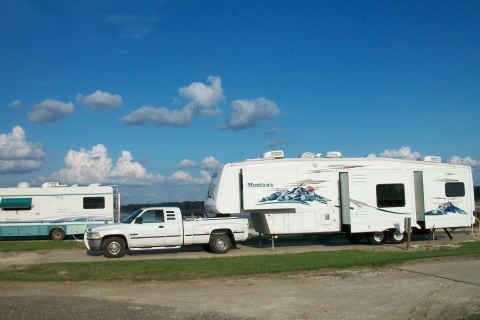 Thanks to another blogger, Donna, who chronicles her travels at Our Adventures with Tassie, we decided to try Tom Sawyer’s Mississippi River RV Park on the Arkansas side of the river. Good choice. 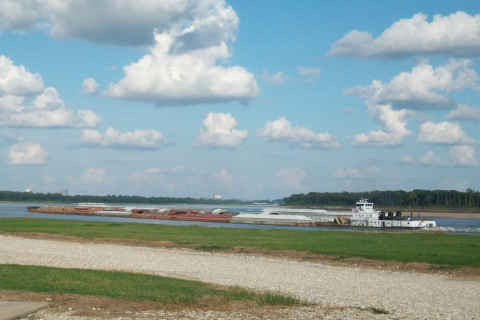 Once you cross the levee, the entrance to the park is quite tranquil looking. Our site was right on the Mississippi River with an extremely level cement pad and good electric. We didn’t even unhook from the truck, thinking we were heading out early the next morning. The Mississippi appears to move much swifter than the Ohio. 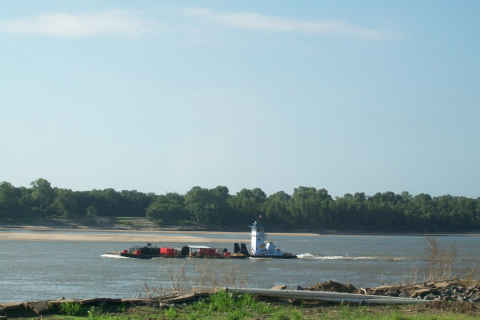 The barges heading upstream looked like they were in slow motion. Here’s what Tinka called a cute barge. It was a small work barge that apparently serviced the others along the river. 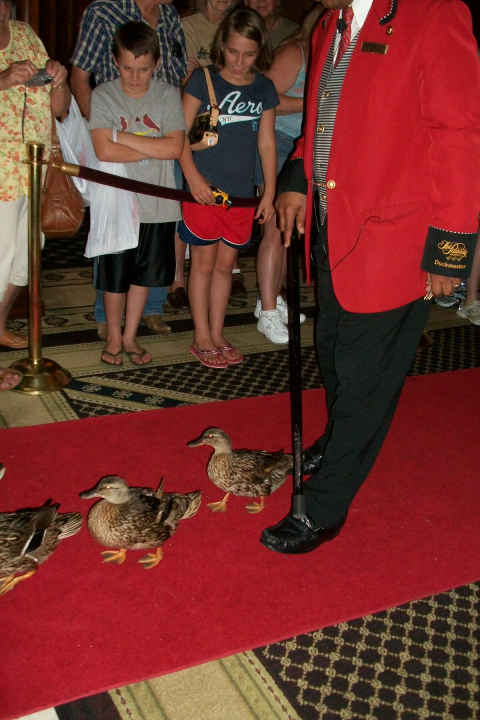 We changed our mind about leaving the next day when we found a brochure for Blues City Tours that provided 3-hour tours of Memphis for $24.00 each. The Tom Sawyer staff was very accommodating and allowed the one day extension to our stay. Maybe we’re spoiled after our great tour of St. Louis, but except for the fact that Blue City picked us up at the RV Park, it was the WORST tour we’ve been on. The company needs to do a little training with their people. First of all, they picked us up 20 minutes late and whisked us off for another 20 minute ride to the Blue City office without one word out of the driver’s mouth. Finally she said for us to go into the office to pay and return to the bus. Other passengers were waiting for our late arrival. 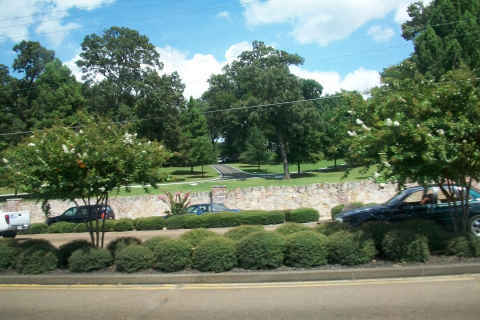 Except for three stops, this was promoted as a drive-by tour of several Memphis sites. About 10 of us finally boarded the bus and off we went. 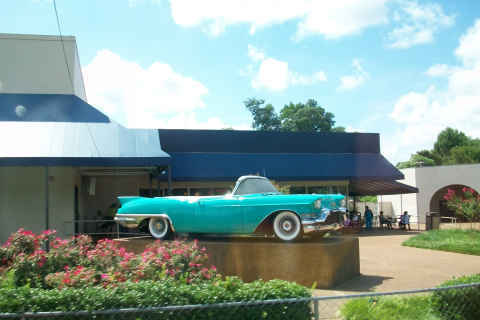 Not a word from the driver until we pulled up in front of the Graceland museum across the street from the mansion. Finally she spoke for a moment about the airplanes and museum, then off we went breezing past the Graceland Mansion too fast to get any pictures. We didn’t expect to get close-ups, but good photos are tough at 40 MPH. Actually stopped for a second to get this wonderful view of the airplanes. 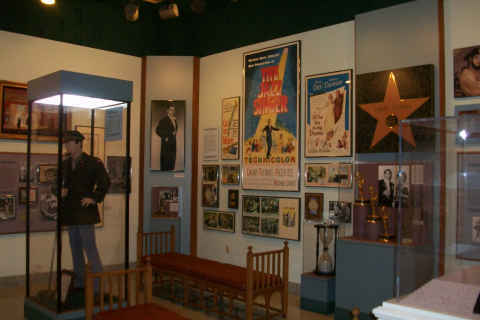 Our best shot of Graceland. Our best Elvis shot was of this old Caddy. They promised a drive-by of Sun Records which never happened. 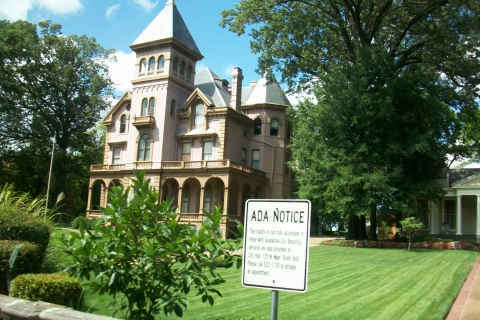 We passed through a neighborhood of beautiful Victorian Homes. 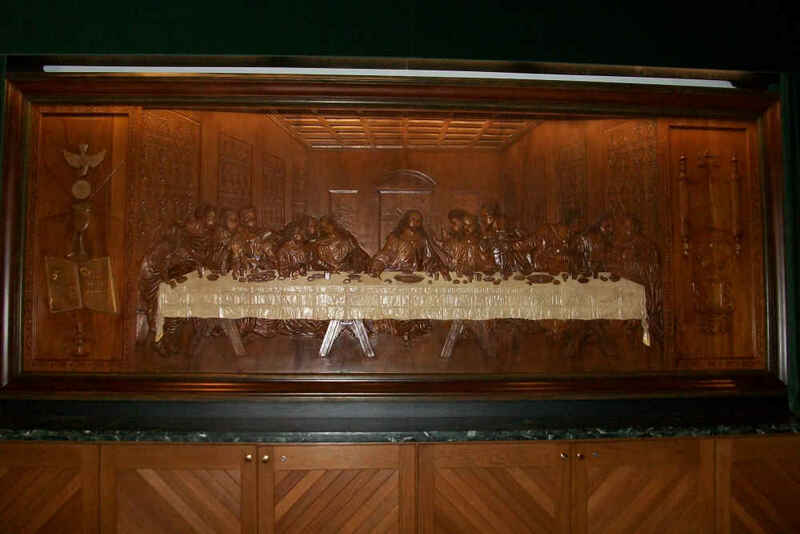 Our first out-of-the-bus experience was the Danny Thomas Pavilion (shrine) at the St. Jude Hospital. 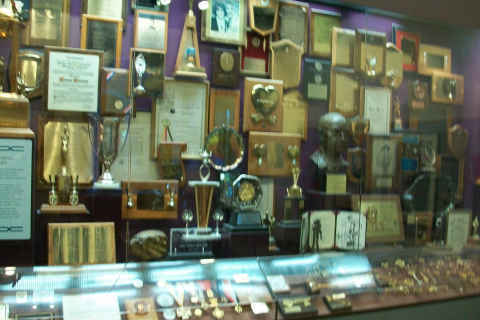 Just some of the actor’s awards. 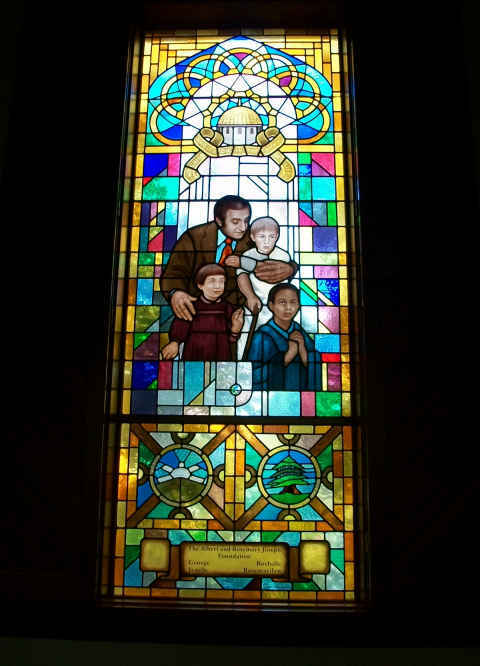 The chapel also has some beautiful stained glass, including this one with a picture of Thomas in the center. Our next stop was at the Memphis Visitor Center where we could see the statues of two kings, B.B. King and of course, Elvis. Then we were dropped of on Beale Street. 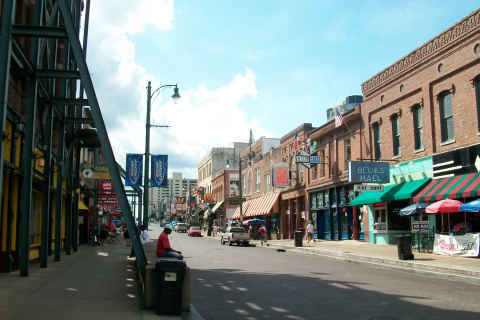 The driver, in her only humorous comment, said that, similar to Bourbon Street, anything goes on Beale Street, but you have to keep your clothes on. At the end of the day, we were dropped off again at the Tom Sawyer RV Park. It’s too bad that the driver wasn’t trained a little better on a proper presentation. On our return home, we asked the driver a few things and found that the knowledge was there but it was trapped in her head. A little history of things that we passed along the route (like the Mississippi River) would have been a real plus. If you decide to take this tour, be sure that you do a lot of reading so you know what you are seeing, because the information won’t be forthcoming from the tour guide. 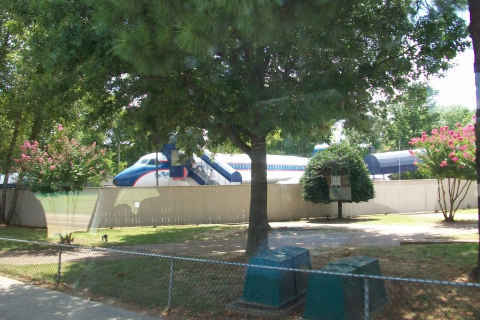 This entry was posted on Sunday, August 23rd, 2009 at 8:13 am and is filed under Arkansas, Tennessee. You can follow any responses to this entry through the RSS 2.0 feed. You can leave a response, or trackback from your own site. If wishes were horses beggars would ride. I wish I could always write articles like this and post at my blog. Great post with details information….